I heard someone say on the radio the other day that today’s college students have significantly less empathy than they used to. The speaker was referring to a 2010 University of Michigan study that tracked college students’ empathy from the 80s and 90s to now. Lots of factors have whittled away empathy: rampant consumerism that turns our gaze to products instead of people; Facebook and other internet follies that reduce human beings to images; violent movies and games that de-sensitize us to others’ suffering; less face-to-face interaction and outdoor play; and poor parenting that focuses too heavily on achievement and not enough on contribution. 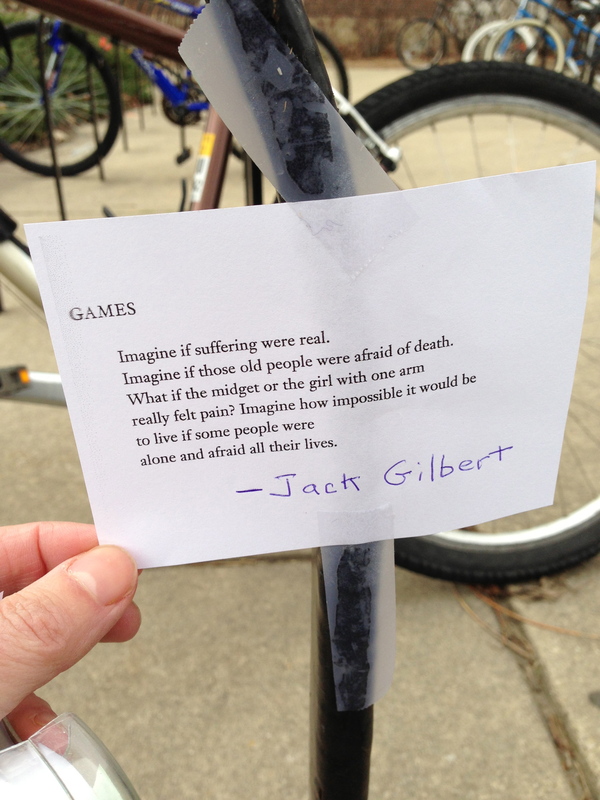 Poet Jack Gilbert’s “Games” is a pithy invitation to empathy. Which is why, after hearing that disturbing statistic on our national empathy levels, I left the poem outside the student center at Michigan State University. Also because the poem is short and therefore more likely to be read by busy students, and because I hoped its title might pull in young readers the way shiny objects attract magpies. Certainly the title drew me in. I was confused how “Games” related to the rest of the poem. A game is a distraction, a playful activity we indulge in from time to time. A reader in 2013 can’t help but associate “games” with “video games,” particularly when the subject is suffering. Video games turn pain, blood, fear and death into pleasure. But I don’t think Gilbert’s poem refers to video games. It was written some time before 1982 in an age when kids played innocent games like Donkey Kong and Pac Man. Violent video games like Mortal Combat didn’t come around until 1993. Still, a couple images in the poem are strangely relevant today. There’s actually a real “game” called Midget Tossing. Even in the virtual world (there’s a live version too, unfortunately) such a competition can only be accomplished with a nuclear-level meltdown of empathy. More striking, this season of “The Bachelor, ” a game show for prostitutes as far as I’m concerned, features a contestant with one arm. I haven’t watched the show, but any suffering the one-armed woman has experienced as a result of her disability will no doubt be used to make it difficult for the bachelor to eliminate her. Underneath the veneer of empathy she may elicit from the television audience is the less attractive appetite for melodrama and entertainment. Perhaps “games” refers to the game of imagining other people’s suffering. Perhaps “Games” suggests taking a break from our own lives to pay attention to other people’s. 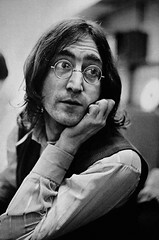 The repetition of “imagine” in the poem calls up John Lennon’s version of that activity. Lennon invites the listener to imagine that all things that separate people and cause animosity have disappeared: religion, nationality, possessions, greed, and hunger. Merely by imagining a worldwide brotherhood, Lennon says, peace will come. The whole process is a cinch: It’s easy if you try. If we look full-on at the face of suffering, it’s hard to go back to our nice little lives. But even as he tells us that paying such close attention makes life impossible, Gilbert quietly asks that we try. 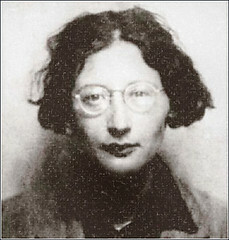 Simone Weil (1909-1943) died from an overload of empathy, along with a healthy dose of tuberculosis. She was 34 years old when she refused to eat more than people living in occupied France ate. She starved herself to death. Talk about it being impossible to live when we imagine other people’s suffering. “The capacity to give one’s attention to a sufferer is a very rare and difficult thing; it is almost a miracle; it is a miracle,” she wrote. In her own cuckoo-cuckoo crazy way, she worked hard at giving others that kind of miraculous attention. She was born to a wealthy secular Jewish family in Paris. Well-educated and brilliant, she took a job operating heavy machinery at a Renault factory. She wanted to align herself with the workers, with the poor. She fought (not well—her weak eyesight made her an unreliable sniper) in the Spanish Civil War and worked for the French resistance. She worked and wrote on behalf of the poor and oppressed. She was a socialist who spoke out against the suffering caused by the powerful Soviet bureaucracy on the weak and incurred a written attack by Trotsky. Weil had mystical Christian experiences and was drawn to the Catholic faith, but she never converted. She was suspicious of organized religion and the suffering it caused through the ages. She believed her vocation was to remain outside the church. Being alive is so extraordinary I don’t know why people limit it to riches, pride, security—all of those things life is built on. People miss so much because they want money and comfort and pride, a house and a job to pay for the house. 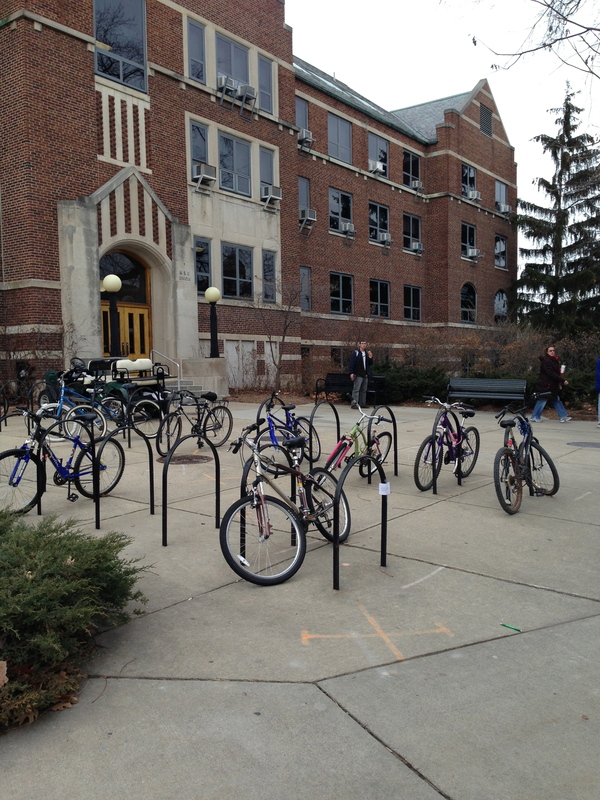 And they have to get a car. You can’t see anything from a car. It’s moving too fast. People take vacations. That’s their reward—the vacation. Why not the life? Vacations are second-rate. People deprive themselves of so much of their lives—until it’s too late. Though I understand that often you don’t have a choice.